Today, Egyptian President Hosni Mubarak has stepped down as president of Egypt and has left the city of Cairo. 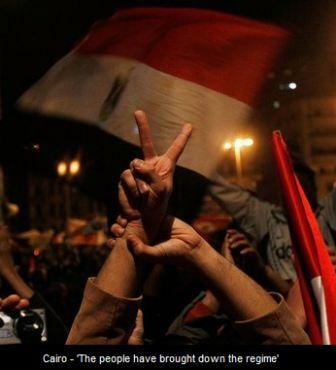 Crowds of protesters in the streets of Cairo have erupted in joy at the success of their protests. American State Department officials are now scrambling to figure out what this means to the American relationship with Egypt. 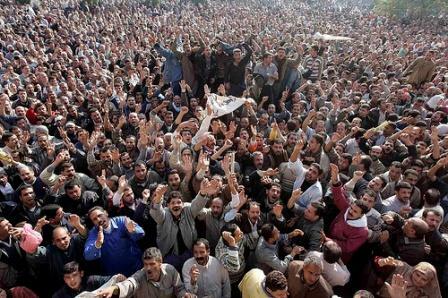 In a shocking reversal of position, Mubarak has decided to leave immediately in response to the crowd of protesters. He has served as president of Egypt for over thirty years. The announcement was made by the Vice President of Egypt. The people are cheering loudly as they now believe they can get the freedoms of democracy they have sought for years. But, who is in charge now. Is it the Vice President or the military? ABC News reports the power has been turned over to the Army at this point. "My fellow citizens. In this difficult time that the country is going through, the president Mohamed Hosni Mubarak has decided to relieve himself of his position as president and the Supreme military council has taken control of the state's affairs. May God protect us," Suleiman said during his somber one-minute announcement on TV. Mubarak has left the city to a private resort near the Red Sea. He vowed to never leave Egypt. President Obama promised his words on this matter in two hours. One out of three people in the middle east live in Egypt. The future of this country is very important to the United States and Israel's future. Now we must wait to see who will emerge as a leader of the new government. Much confusion seems to prevail at this point. President Obama was in a meeting in the Oval Office when he was notified of Mubarak's decision. He is now working on his statement for 12:30 CST. Interesting side note, today is Robert Gibbs' (White House Spokesman) last day on the job. What a way to go out! It appears the final straw was the military refusing to fire on the protesters and taking their side of the events according to a Fox News analyist. People around the world are calling this "Egypt's Tea Party". Is this what it will take to get rid of President Obama? He won't even listen to protesters in America! Early comments from Egypt's army appear to indicate they will look to set up free elections and a new constitution giving the protesters what they have been seeking. Freedom of speech, freedom of the press. 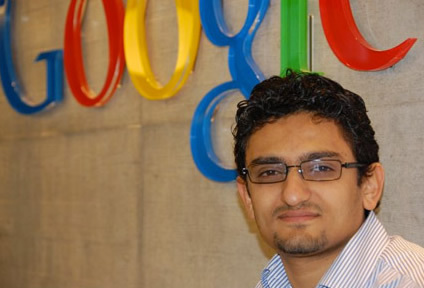 Formal Google executive, Wael Ghonim, "Now is the time to get to work". He is being seen as one of the leading voices of the "popular crowd". He is seen as a potential replacement to Mubarak as president according to some. The Egyptian military issued a communiqué pledging to carry out a variety of constitutional reforms in a statement notable for its commanding tone. The military's statement alluded to the delegation of power to Mr. Suleiman and it suggested that the military would supervise implementation of the reforms. Online reports indicate the Swiss have frozen the Swiss bank accounts of Mubarak. Pres. Obama learned the details of Murbarak's resignation from network news, not from the intelligence agencies. Yesterday, intelligence groups testified Mubarak would step down yesterday. He did not. What are we paying these intelligence departments for?